"An old fashioned country flea market, just outside Anna. Sellers will be spread out across the tiny little farm selling whatever they want. Early bird shopping pass is available on the website to come shop during set-up. Food provided by The Guava Tree Food Truck. " Admission is $2 or free with 2 cans of food. You may purchase an Early Early Bird Shopping Pass for $10. Reserved space holders will receive free coffee, bottled water, and a goody bag. These spaces must be paid for by March 20th. Applications are available here and are due by March 30th, 2013. For more information, visit their website or contact their event coordinator at girlmakesgoods@gmail.com. 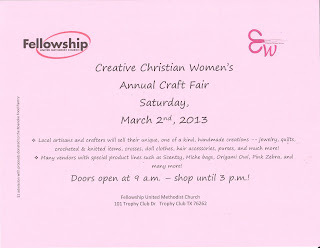 "Come shop with various crafters and independent contractors ranging from jewelry, clothes to pampering products!" Booths are indoors, approx 100 sqft, and cost $50. This includes tables, chairs, electricity, and wifi included. Applications are available here and are due by March 2nd, 2013. For more information, visit their website or contact their event coordinator at info@handleyheightsplace.com / (817) 457-0080. 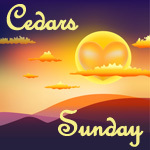 "An indoor market where local artists, crafters, and designers sell unique, handmade items every month!" This is a Handmade Items Only event. "Prizes to be given away for the following categories Best of Show Pre-1949, Best of Show 1950-1959, Best of Show 1960-1969, Best of Show 1970-1979, Best of Show 1980-1989, Best of Show Paint, Best of Show Interior, Best of Show Truck, Best of Show Car, Best of Show Bike, People's Choice, and Cheerleaders Choice. Also there will be a variety of vendors. Registration is 10 per car or bike Free Dash Plaque & T-Shirt for the 1st 40 registered. DOOR PRIZES & ENTERTAINMENT!" Booths are 6 X 8 for $40. This fee includes 1 table and 2 chairs per booth. Electricity is available upon request. Concessions available. For more information, visit their website or contact their event coordinator, Amy, at stooksberrys@aol.com / 214-403-3697 OR Janice at JEOleson@garlandisd.net / 214-663-5286. Booths are in the parking lot for $20 each. To apply, contact their event coordinator at alvinandmonnie@sbcglobal.net / 817-996-2717 asap. Please contact them prior to sending payment and include the name of your business with your payment. Handcrafted Items, Commercial Items, Full Food Concession, Gourmet Items, Antiques, Collectibles and much more. Indoor facility and covered breezeway area. Fun, Family, Friendly Market!" 2 miles west of the I35E and US 287 interchange in Waxahachie, directly on the US 287 north bound service road. Booths are 10 X 12 and cost $65. Applications are available here and are due by March 7th, 2013. For more information, visit their website or contact their event coordinator, James, at tradedaywaxahachie@sbcglobal.net / 214-202-1788. For spanish, call Sal at 214-998-9754. This fee includes one 6 X 30 table and two chairs. A tent is required, but you may bring your own if you prefer. If confirmed by April 15, you company will be listed on event website. For more information, visit their website or contact their event coordinator at lizzie@miracleplayersfoundation.org / (214)729-6704. "Come out for some shopping with amazing vendors and businesses, treat yourself to yummy food and snacks, and enjoy watching a fashion show and other entertainment, and book a mini session for Easter pics with Andrea Lopez Photography. This is a don't miss event and great for shopping for goodies for those Easter Baskets as well as Easter Decor, Spring flare, and just good ole home town fun! Raffles, Giveaways, Coupons, and More Goodies in Store for the shoppers! Hope to see you there!" For more information, visit their website or contact their event coordinator at texasmonkeyboutique@gmail.com / 972-922-0584. "This is a GREAT family oriented event for a day of supporting small business and getting together as a family. There will be a bounce house, pictures with the Easter Bunny as well as the Easter Egg Hunt. Come and enjoy great fun with NO P.A.P as we strive to take back our children and communities one PARENT at a time." Located off of I-635 exit 1 in Balch Springs at the Balch Springs Civic Center, next to the Library and Fire House. Outdoor Booths are available at rate of $45.00 (limited availability). Tables are $10 / ea and electricity is $10. Applications are available here and are due by February 22nd, 2013. For more information, contact their event coordinator at BowTasticalBowsandGifts@gmail.com / 214-868-8028. "The John Paul II High School 2nd Annual Mayfest Market will be held on Saturday, May 4th!" Electricity only available in certain locations $10. Applications are available here and are due by March 15th, 2013. For more information, contact their event coordinator, Gina, at mayfestmarket@gmail.com. "First Baptist Flower Mound will be hosting the Children's Ministry Craft Fair and Fundraiser. All booth space rental fee goes to the Children's Ministry to help children go to camp to learn about Jesus Christ as a lot of parents could not send their children without some financial help." Some tables and electricity are available but limited. Chairs are available. The church kitchen will be open to sell snack/fingur foods an drinks. Free coffee and snack for the early birds while setting up their booth. Applications are available here and are due by April 1st, 2013. For more information, visit their website or contact their event coordinator at LNDEVFAULCONER@VERIZON.NET / 469-964-8933. "Dallas/Forth Worth Pride Movement is a non-profit 501(C)(3) organization that exists to create a sense of unity and social support within the Black LGBT community.The mission of Dallas/Fort Worth Pride Movement is to promote social awareness, unity, self-empowerment, mentor ship and positive visibility throughout the Dallas/Fort Worth LGBT and affirming community of color through education, health promotion, advocacy and coalition building. " Booths are a 6ft draped table and two chairs for $150, per day per event. For more information, visit their website or contact their event coordinator at Derrickdfwpride@gmail.com. "Shop anything from food to makeup to handmade everything to jewelry and candles." EHBC members get a $5 discount. One table will be provided, if needed, tables are $5. Electricity must be requested and they must provide their on extension cords if needed. Applications are available here and are due by July 5th, 2013. 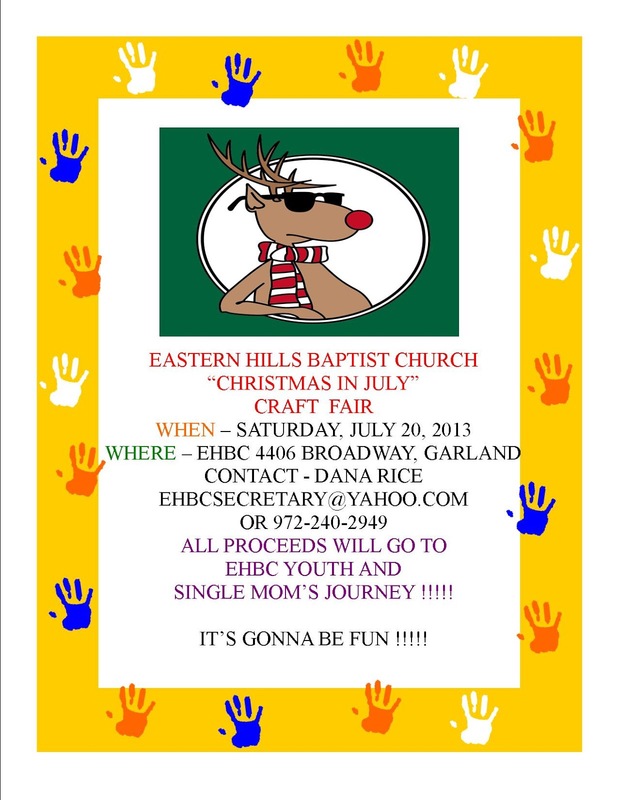 For more information, contact their event coordinator at ehbcsecretary@yahoo.com / 972-240-2946. Fees include electricity and access to their free wine tasting and beer tasting! Applications are available here and are due one week prior. For more information, visit their website or contact their event coordinator, Jorge, at info@dallashandmade.com / 214-914-4529. 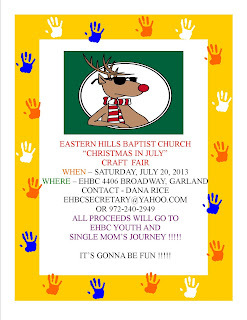 "Come shop with various crafters and independent contractors ranging from food to clothes to pampering products"
No fee to enter but they are accepting donations to benefit the Texas Pythian Home.